Both Najeeb Jung and Anil Baijal knew exactly what they were doing as Delhi L-G , yet if they did act in a peculiar manner, it was not because of ignorance but because of subservience. The irony of our times is that the ordinary becomes extraordinary. In any parliamentary democracy, judges and lawyers, parliamentarians and legislators, and ministers and civil servants know where the true power lies. It lies with the elected representatives who, among themselves, will choose a prime minister or a chief minister. There is another appointed functionary, called governor or lieutenant governor, who may enjoy the prestige attached to the office but is obliged to act on the aid and advice of the council of ministers. The phrase ‘aid and advice’ is the cornerstone of representative government. Wherever it occurs, the unmistakable conclusion is that the person who renders the aid and advice is the one who holds real power and the person who receives the aid and advice is only the titular head. The principle is so well established that any one who pretends to hold the opposite view is exactly that — a pretender. Section 44(a) of the Government of National Capital Territory of Delhi Act, 1991, reinforces the legal position. It provides for the allocation of business (to ministers) “with respect to which the Lieutenant Governor is required to act on the aid and advice of his Council of Ministers”. Mr Najeeb Jung and Mr Anil Baijal were not novices. They belonged to the IAS and were seasoned administrators. Besides, Mr Jung was, for some years, the vice-chancellor of Jamia Millia Islamia. Mr Baijal had held several important posts in his career, including Union home secretary and had dealt with the Delhi government. Both knew exactly what they were doing as Lieutenant Governor of Delhi, yet if they did act in a peculiar manner, it was not because of ignorance but because of subservience. They acted like the viceroys of the British Raj and, in the process, assaulted the fundamental tenets of a representative democracy. The Central government’s and BJP’s spokespersons may now say that the judgment of the Supreme Court did not lay down new law but only reiterated the old legal position. If that is correct, the logical conclusion is that the judgment of the High Court, Delhi (which was reversed by the Supreme Court), was wrong and bad in law. Ask the Central government why it had stoutly defended the wrong judgment before the Supreme Court; I am certain the spokespersons and the blog-writers will not condescend to answer! Also Read: Hindustan Times Editor Accused Of Spying On Kejriwal Govt For Modi? The government contended that “the ultimate administration with respect to Delhi shall remain with the President acting through its administrator” — Rejected. The government contended that “although Article 239AA confers on the Legislative Assembly of Delhi the power to legislate with respect to subject matters provided in List II and List III of the Seventh Schedule, yet the said power is limited by the very same Article” — Rejected. The government contended that “it is the ‘Lieutenant Governor’ and not the ‘Council of Ministers’ who is responsible for the administration of the Union Territory” — Rejected. The government contended that “the principle… wherever there is existence of legislative power there is co-extensive existence of executive power, is with respect to only the Union and the States and is not applicable to Union Territories” — Rejected. The government contended that “the aid and advice rendered by the Council of Ministers is not binding upon the Lieutenant Governor” — Rejected. The government contended that “the phrase ‘any matter’ in Article 239AA(4) has to be interpreted to mean ‘every matter’” — Rejected. Having lost in the swings, the ill-advised Central government is trying to win in the roundabouts. It says that Services (meaning appointments, transfers and postings of civil servants in the Delhi government) will continue to be under the control of the Lieutenant Governor. 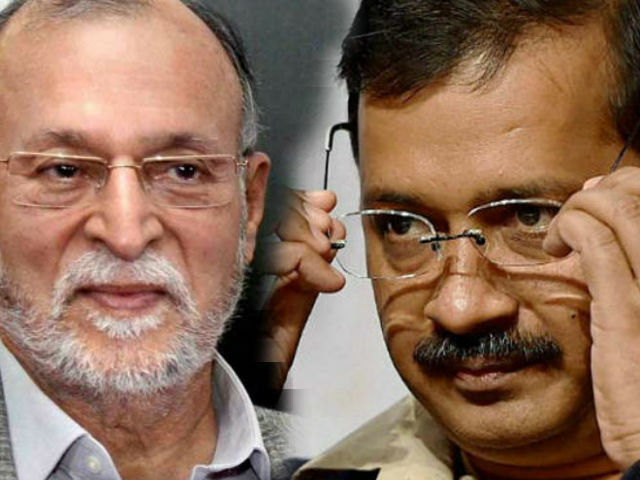 The Central government is spoiling for another fight with the Delhi government, and the first shots were fired by Mr Baijal when, post-judgment, he ordered transfers and postings of three senior officers. In my view, Mr Baijal was wrong and his wrong action proves that he is acting at the behest of the BJP-led Central government. Recent blogs have revealed that the inspiration behind the Central government’s submissions before the Supreme Court was, among others, Mr Arun Jaitley. Not reconciled to the unanimous judgment of the Constitution Bench, Mr Jaitley has once again set up another legal battle on the question of control of Services. In his blog he wrote, “any presumption that the administration of the UT cadre of services has been decided in favour of the Delhi Government would be wholly erroneous”. Is Mr Jaitley suggesting that the elected Delhi government may exercise executive powers but will have no control over the civil servants who will discharge the responsibilities? The argument defies common sense. But there will be another judgment day. Previous articleWhy The SC Decision Upholding Death Penalty Was Need Of The Hour? Next articleCan India Take Advantage Of The American-Chinese Trade War? P Chidambaram, Congress Leader and former Finance Minister of India.